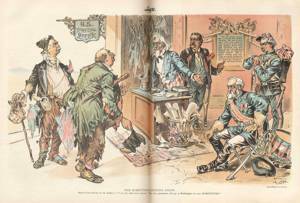 Like “Their War-Records Contrasted," this double-page cartoon reminds voters of the contrasting Civil War records of the men on the two parties’ national tickets. On the left, Democratic vice-presidential nominee Adlai Stevenson (left) and presidential nominee Grover Cleveland (right) are caricatured as hobos in front of the “U.S. Recruiting Office.” During the Civil War, both men hired substitutes to fight for them. Here, they are poor substitutes who are turned away from the nation’s highest offices by Uncle Sam, who announces that the Republican ticket of President Benjamin Harrison (left) and vice-presidential nominee Whitelaw Reid (right) will be the Democrats’ substitutes in the White House. During the Civil War, Harrison fought as an officer in the Union Army, while Reid was a battlefield correspondent. The heroic and dignified appearance of the two Republicans contrasts starkly here with the disheveled and irresponsible character of the two Democrats. Behind Uncle Sam, General Daniel Sickles, a Democrat who lost a leg in the war, points to his declaration that he and all Union veterans in New York would vote against Cleveland.